Please note that, due to the large acceptance angle of the camera, all gratings may produce zeroth-order ghosts at some grating tilts. The 831 and 900 gmm gratings are particularly prone to this at typical grating angles. 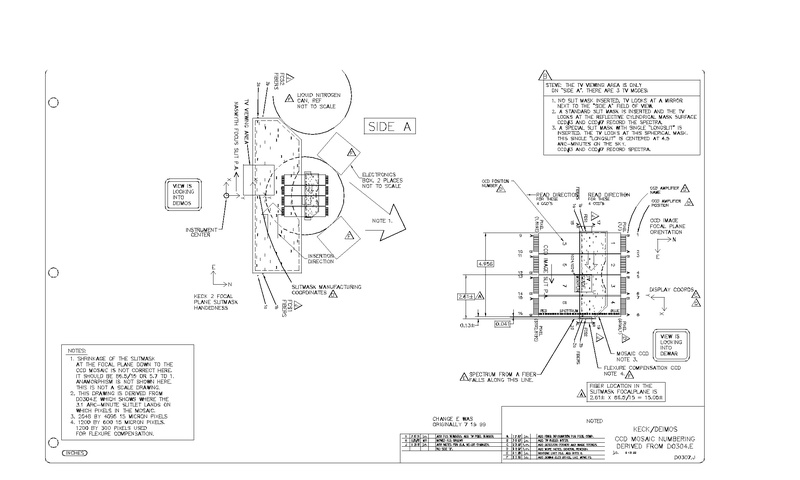 The following limits in mask design keep the mill out of the "forbidden zones" around the edge of the mask. Note that this is for the slit corners. Violations of hard limits result in the slit being rejected, ie., not milled. constant as the mask form probably occults to this point anyway. NB: There's currently an ambiguity about the relief cut around the slitlet. This currently is _included_ in these limits, but as its size is not known to the user a priori, it makes life difficult. I am arguing the relief cut is under the control of the milling folk, and hence should be handled by them, not the mask designers. Marc0_Slit -- "Marc's original design Slits"
Marc0_Obj -- "Marc's original design Object Holes"
Mask.2000 -- "Astrometry Mask for 16h field"
Here are the approximate conversions of encoder counts (G3TLTVAL, G4TLTVAL) into grating angle (defined as the angle between grating normal and the Z-axis or rotation axis of DEIMOS, with increasing angle as the grating normal moves outboard, or +Y ). Angles in degrees. These values are predicted with "trace" using the latest (Feb 28 2003) models. The on-axis wavelength shown, along with the on-axis anamorphic factors. The tilts are theoretical, and may not agree precisely with the values in the current control software. Spacings in pixels, angles in degrees. Each CCD is described by an offset to its center, and a rotation. CCD#3 is taken as the fiducial, assumed to be in the right location/orientation. The offsets are the sum of (Xnom,Ynom) and (delX,delY), where the nominal values includes active chip size, chip edges and the nominal physical gap. Note that while the rotations, x- and y-spacings are close to nominal, the y-centers move systematically to form a slight stair-step pattern. Grating/slider  gmm    "roll"   "o3"    "mu"
Why there's a slight correction to the GxTLTVAL (besides the zeropoint offset) remains a huge mystery. The optical model is still evolving and enhancements are likely to take place occassionally. Sense & Sensitivities: To understand the effect of the numbers above, keep in mind that "roll"/theta-y moves images in x and "o3"/theta-z produces a skew in x, whereas grating tilt moves images in y. The order of magnitudes shifts are 0.001-deg / pix for tilt and roll. 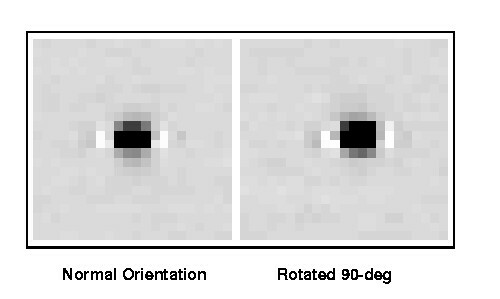 Theta-z is harder to interpret, but 0.01-deg should cause a 1 pixel shift of top relative to bottom. Gain and readout noise were determined from 2 flats and 2 "biases". The results are: Read noise approx 16 e, inverse gain about 3.7 e/DN. It appears we are in what Photometrics calls "Gain State 4". NB: The neon lamp does not produce acceptable flats in short exposures (eg. 25ms) -- apparently there are waves in the plasma that produce spatially non-uniform illumination at the level of +/- 2%. Normalized surface fits to a flat field, illuminated by light on the garage door, are expected to be close to the actual flat-field shape. Note that the slitmask has response around 25-30% of the (peak) mirror in the vicinity of the longslit. However, also note that this particular slitmask was badly scratched and so may not be a good representation. Also note that this data was collected Oct.27 before good TV alignment! Plate Scale: Images taken of the TV grid-of-holes mask indicate the plate scale is 0.205 arcsec/pix. The spacing of the grid marks on this mask is 12 arcsec. 1. Take direct images of the masks at ROTATVAL near -45 or 135. Y-flexure is near zero at these angles. During the October 2002 DEIMOS Commissioning run, autoguider centroids were monitored during some exposures in order to characterize typical guiding errors. The results were less than encouraging: guider centroids were often off at a level of 0.1--0.2 arcseconds (compared with the spec, which is 0.05 arcsec for tracking). 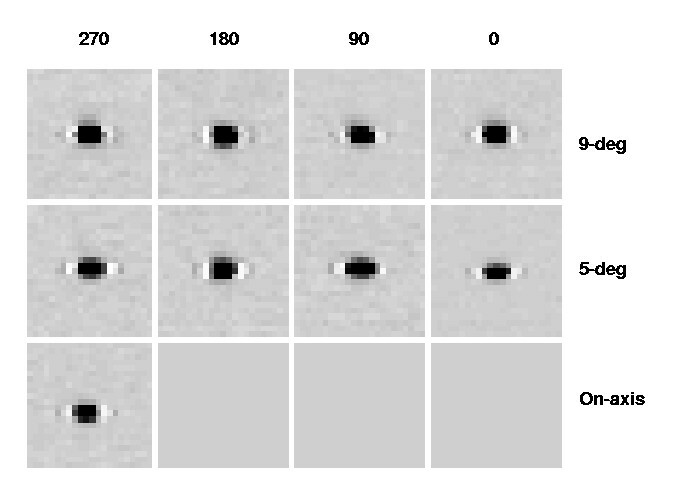 When added in quadrature with the typical seeing, these do not represent a huge degradation in image quality (although the degradation is significant). However, they are worrisome with respect to alignment, particularly if the guide star is faint and therefore integration times are large (ie not small compared to the alignment image integration time). (c) centroids seem to be drawn toward integer pixel values, often leading to a bimodal distribution in the errors (the plots are centered on "half-pixel" values in all cases). In fact, this may be the dominant problem and would indicate an error in the centroiding algorithm. edge where the slitmask goes. NB: This is 0.8 mm above the correct position! is in focus at 70mm distance from the inner edge (ie where mirror abuts). "chicago'd" bolts on nose plate; there's now an access hole to the second one). be an adjustment for this one. bringing the surface into high relief. edges as above -- these spots are well focused). 5. Rotate PXL head to remove field rotation. to be run on DEEP observing time is TBD). * (Brighter) QSO targets, different spectral range than survey observations. difficult to select via photo-Z with our passbands). * Survey of CNELG candidates. "back-up" time be set aside for Category 3 projects of interest to "junior"
team members (eg. postdocs) and/or people who actually go observing. Such programs should probably be run through an internal TAC. for the Team meeting. Thanks! Mosaic of COHU images at nominal best focus (except for 5-deg, PA=270,90 where focus -40 micron was used). Note that the elongation and aliasing in X are artifacts of the COHU; in the comparison , the COHU was rotated 90 degrees, so true PSF asymmetries will rotate whereas camera defects will not.